The Aix-Marseille Université "Master Recherche, Etudes et Conseil en Sciences de Gestion" offers students the best conditions possible to get accepted in a doctoral program and embrace an international career as university professor. The program also leads to upper ranks in the best consultancies or to high management positions in international and national companies. By providing one side the basics of research methodology in management, and on the other side electives dedicated to specific disciplines (such as marketing, HR, finance…), the Aix-Marseille Université Master of Research meets research centers and companies’ expectations. Students must possess at least a four-year post-secondary diploma (at least 240 ECTS credits or equivalent for non-European candidates). To give an idea, most candidates graduated in management or economics from university or business schools. However we warmly welcome candidates coming from engineering schools, sociology studies, mathematics, philosophy, law, or political sciences too. Selection is made upon application (TAGE-MAGE or GMAT tests, TOEFL, TOEIC or IELTS, DELF/DALF for non-French speaking candidates – TC4 or equivalent, diplomas, recommendation letters, letter of interest, essay) and interviews. 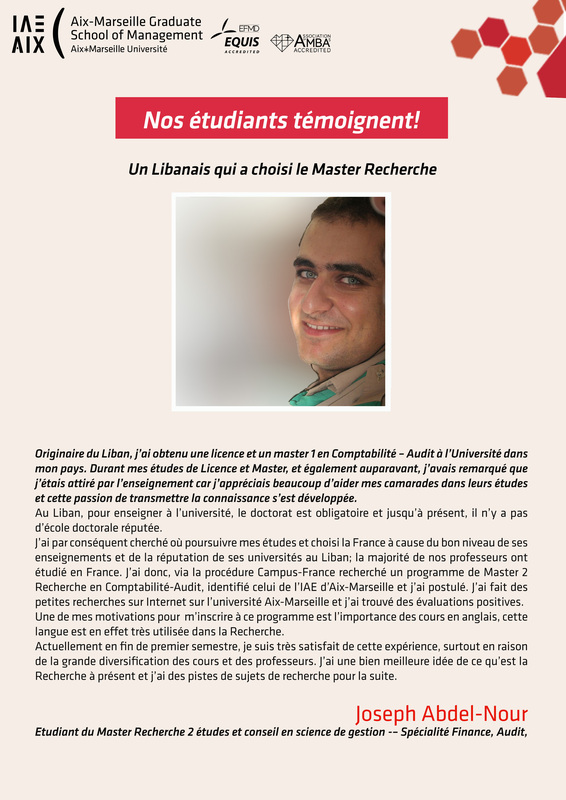 The Master Recherche is supported by and benefits from the expertise of three Aix-Marseille Université entities: the Faculty of Economics and Management (Faculté d’Economie et de Gestion – FEG), Aix-Marseille Graduate School of Management (IAE Aix), and the Institute for Public Management and Territorial Governance (Institut du Management Public et de Gouvernance Territoriale – IMPGT). This program offers a wide range of courses which allow students to specialize in five different fields. During the Fall semester (September – December), students attend common core courses dealing with research epistemologies and methodologies in management. The Spring semester (January – April) is dedicated to specialization (e.g., marketing courses if the specialization is in marketing) and ends with a final presentation. Finally Summer (May – August) is devoted to the master thesis which is defended during the last week of August (session 1) and the last week of October (session 2). Approximately half of the graduates aspire to a doctorate and to become professor. To this end, professors involved in the program help students to define their projects, choose their supervisors and more generally to provide the necessary conditions to continue doctoral studies at CERGAM. They also help students finding funds for their doctoral studies: doctoral contract, regional scholarships, CIFRE contracts (Conventions Industrielles de Formation par la Recherche – partnership between a company, a laboratory and a student). The other half of the graduates pursues a career in consulting or executive management (marketing, human resources, strategy). With students and well-known speakers from all five continents, this program and its international dimension are a real asset for your career.